The Lost Desert, the name conjures up thoughts of Coltzan's Shrine, a marvelous plot, and... well, burnt food. But the Lost Desert has something more. Head over to the Petpet Stall and you'll see what I mean. For some Neopians, there is one simple thing that matters in deciding which petpet they are planning to purchase, and that is price. 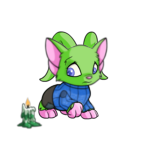 Sometimes, only the most expensive petpets are wanted, and other times, one can only afford the cheapest of the cheap. Cheap doesn't necessarily mean bad, and often, cheap means a Scarabug! Usually found for under 500 NP on the Shop Wizard, Scarabugs are neat looking and quite affordable. They have got a leg up over their cheap counterparts, like the Spyder, because they are more exotic. Scarabugs are an insect-type petpet that comes from the Lost Desert. They have been known to travel in swarms and constantly make a loud humming sound. Their attitude is as colorful as they are, and they can be a bit of a handful. Before you run out and buy a Scarabug, there are a few things you should be aware of. The most important step of deciding if a Scarabug is right for you is analyzing your personality. Do you like peace and quiet? Then you will need to invest in a good pair of earplugs, because Scarabugs are NOISY. They constantly hum and buzz to communicate and they are pretty much impossible to understand. And then, when you can't figure out what they are trying to tell you, they will only get louder! It might pay to hire a local Buzz translator for these occasions. Patience is a virtue. This is especially true for Scarabug owners. Because Scarabugs usually travel in swarms until they become a petpet, they are pretty social little critters. Do not expect to get a lot of alone time after you adopt one, or make sure you adopt twelve or so more. Scarabugs are definitely feisty. If you tell it to go outside, it probably won't. If you ask it to clean up its corner of the neohome, it will probably make a huge mess. You should get used to this little bug doing the exact opposite of what you tell him. Scarabugs are not going to do very well with a pet who prefers to be alone most of the time. Scarabugs have a very high energy level, so a lazy pet probably shouldn't adopt one. The most compatible match would be a friendly, hyper pet who has a lot of patience. Make sure you're not afraid of bugs. If the idea of a Scarabug crawling on you in the morning to wake you up makes you want to swat at it, Scarabugs aren't for you. Not a lot of Neopians know that Scarabugs have claws! Not only can they scratch you or your pet while trying to play with them, but they will destroy your furniture unless you keep them in check! Regular nail trimming should do the trick, along with buying a Scarabug Scratching Post. Also, those claws may come in handy should your petpet need to defend the neohome or battle in the Petpet dome. Scarabugs are picky eaters. You may want to stock up on Pyramibread, because some refuse to eat anything but food from the Lost Desert. On the other hand, other Scarabugs will eat anything and everything, so it may be a good idea to lock up your valuables until you figure out which kind of Scarabug you've adopted. Then there are the basic necessities of having any petpet, not just a Scarabug. It will need a place to sleep, food to eat, and a place to do its business. A good training method for taking care of a pet is playing the game Petpet Sitter. If you get overwhelmed in the first few minutes, maybe you should think about choosing a Pet Rock instead. That may make Scarabugs seem like far too much of a nuisance to consider buying one, but they can be easily managed if you know how to keep them happy! Scarabugs are going to want to visit their old home every once in a while, so you should be comfortable with visiting the Lost Desert, Qasala, and Sakhmet. While they're there, they'll probably want to play a few games of Swarm and visit Coltzan's Shrine. To keep them from getting homesick, you can get out a deck of cards and play Pyramids sometimes! In the end, the positives to owning a Scarabug far outweigh the negatives. For instance, the buzzing and humming that makes a lot of potential owners change their mind is actually one of a Scarabug's best qualities. Get four or five of them together and you can have your own little band. That is, if you like music that sounds like bug calls. Scarabugs are fiercely loyal. You can always count on them to follow you wherever you go, and if you accidentally get into a tight spot, they will do their best to get you out of it. 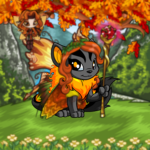 My Kougra found her petpet Scarabug while exploring in Geraptiku. She got stuck in the Deserted Tomb and begged for help, which came in the form of little Aken, who flew around and helped her to find the exit. Like anything, there are good parts and bad parts to having your own Scarabug. They can be needy. They can be loud. They can be disobedient. However, they can also be great companions, protectors, and they are extremely affordable.